Eight teams. Seven Matches. One champion. 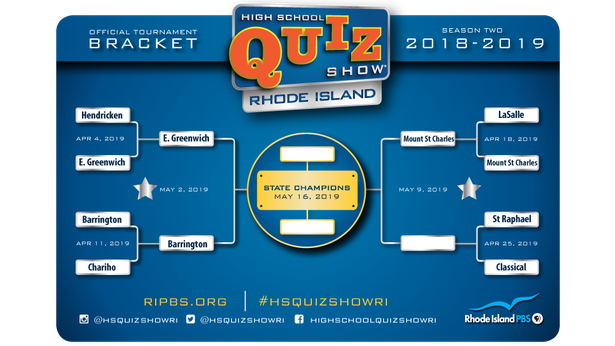 Who will bring home the High School Quiz Show: Rhode Island®trophy? Congratulations to Mount Saint Charles Academy– you are one step closer to the championship title. Many thanks to the team and coaches from the LaSalle Academy. We hope to see your school back for season 3! 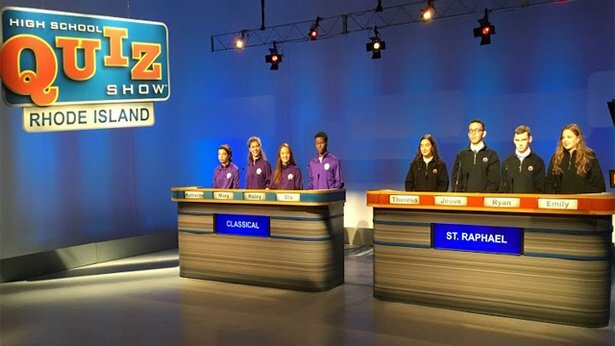 This week, Saint Raphael Academy of Pawtucket and Classical High School of Providence compete in the last quarterfinal round on High School Quiz Show: Rhode Island April 25 at 7 p.m. Follow us on Twitter @HSQuizShowRI, Instagram @ HSQuizShowRI, and Facebook @HighSchoolQuizShowRI. In the semifinals, East Greenwich High School faces Barrington High School on May 2, and Mount Saint Charles Academy plays this week’s winner on May 9. The championship match airs on May 16.